A month ago, I began pre-op dieting so that I could lose as much weight as possible prior to surgery. At that time, I took measurements of my biceps, forearms, neck, chest, bust, waist, hip, thighs and calves so that I could see how much I would shrink over time. The last time I lost a significant amount of weight I didn’t take measurements regularly, and I should have so that I could see just how much progress I was making. Because even if the scale didn’t move, inches were still being lost and clothes were fitting just that much better. 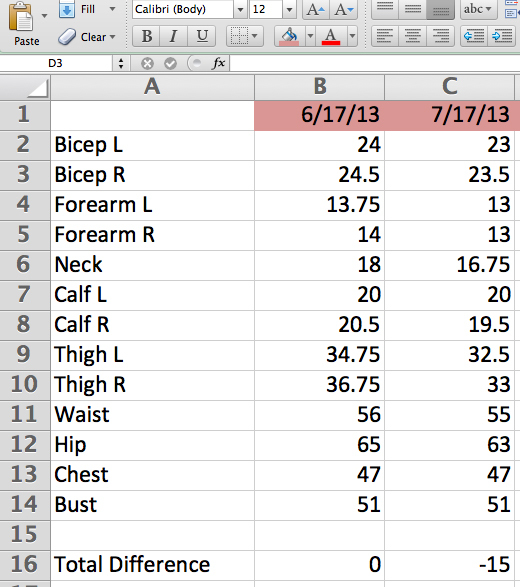 So I started documenting my measurements in an Excel spreadsheet so I could track myself over time. I am a self-avowed data hound (I love it more than the average bear! ), but that’s because I’m also a scientist so this is part of my nature. Fifteen inches gone! And this is mostly before I had surgery. Wait until next month, when I will have been sleeved for a full month…wonder what will happen then? Stuff like this is what will keep me going when the scale decides it’s not going to move. I can’t wait to see what happens once my sleeve really starts doing its thing. I am excited and motivated to make this thing WERK. This entry was posted in NSV's, post-op, progreso, success, werk! and tagged data, measurements, non-scale victory, sleeve gastrectomy, VSG, weight loss surgery, WLS. Bookmark the permalink.